The road tracking task requires subject to follow a windy road with an analogue input device such as a mouse or joystick. 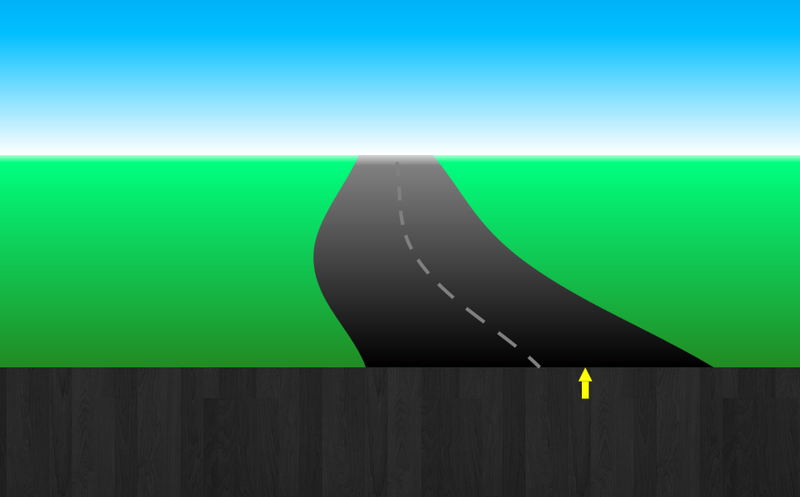 The difficulty of the road can be adjusted by setting amplitude and frequency filter for the random road track and the size of the window which provides the preview on the upcoming track. Performance in the the road tracking task is primarily measured by the SDLP index (standard deviation of lateral position) which is also used as an indicator of discovering fatigue during actual driving. By defining easy vs. windy road conditions the attentional demands can be varied. To be even more realistic, the road tracking task can be overlaid with disturbances such as random turbulence or inclined road conditions to force subjects to constantly re-adjust their cursor position. The tracking task can be configured as pursuit tracking in which the cursor reflect the input device and the subject must make same movements as the road, or alternatively as a compensatory tracking task in which the subject must compensate the road track to keep the cursor on the target area. Multiple segments for one run can be defined to design tracks with changing conditions. Performance indices are recorded for each segment and in total. To analyse tracking data in detail offline, you can also download raw data per tracking cycle (~33msec). Verster JC, Roth T. Predicting psychopharmacological drug effects on actual driving performance (SDLP) from psychometric tests measuring driving-related skills. Psychopharmacology (Berl). 2012;220(2):293-301.